BAPTISM! Why is this sacrament so misunderstood by so many people? It is the entry rite into the Church, and it replaces the Jewish entry rite of circumcision (Colossians 2:11-12). The baptism that we undergo today is much different than the original baptism of John the Baptist, which was only a baptism of repentance. 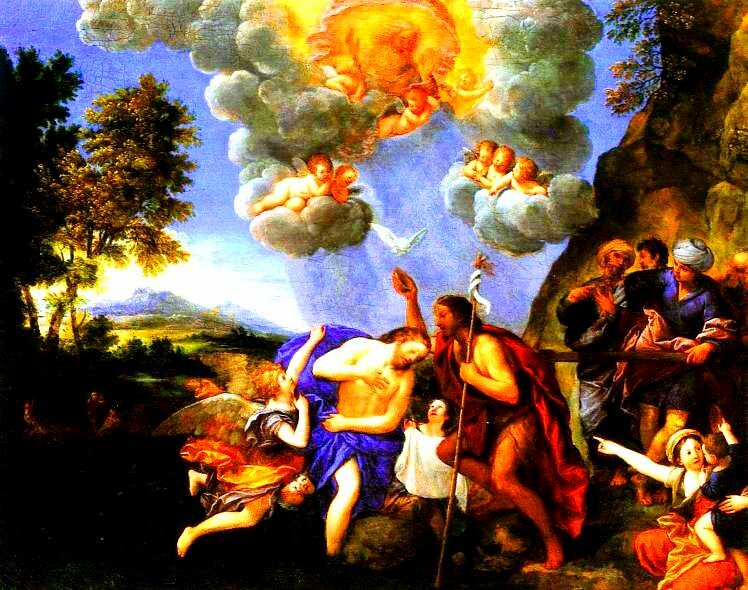 The Baptism of Jesus Christ not only forgives all sin, but gives us the gift of the Holy Spirit as well. In John the Baptist's baptism, the penitents actually confessed their sins to their baptizer, which is another proof text for the Catholic sacrament of confession. The bible never says that baptism is only "symbolic", which some protestants today believe it is. The Holy Spirit IS NOT SYMBOLIC, but real! A foreshadowing of of NT baptism was given to us in the OT when Naaman the Syrian washed 7 times in the Jordan to cleanse his BODY of the blight of leprosy (2 Kings 5). This directly points to the more perfect new covenant, where water cleanses our SOUL of the blight of sin. 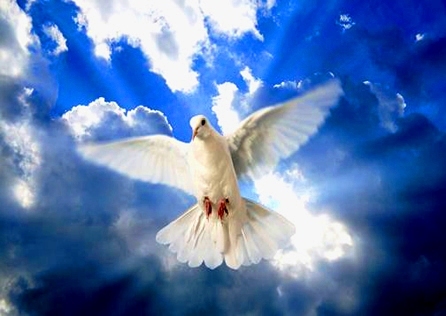 Matthew 3:16, The baptism of Jesus, where the Holy Spirit in the form of a dove, descended from heaven onto Jesus. This sacrament therefore makes us reborn in Christ, with the Holy Spirit coming down into us, living in our body, his temple (1 Corinthians 3:16). 1 Peter 3:20-21: who formerly did not obey, when God's patience waited in the days of Noah, during the building of the ark, in which a few, that is, eight persons, were saved through water. "Baptism, which corresponds to this, now saves you, not as a removal of dirt from the body but as an appeal to God for a clear conscience, through the resurrection of Jesus Christ"
Mark 1:4-11: John the baptizer appeared in the wilderness, preaching a baptism of repentance for the forgiveness of sins. And there went out to him all the country of Judea, and all the people of Jerusalem; and they were baptized by him in the river Jordan, confessing their sins. Now John was clothed with camel's hair, and had a leather girdle around his waist, and ate locusts and wild honey. And he preached, saying, "After me comes he who is mightier than I, the thong of whose sandals I am not worthy to stoop down and untie. I have baptized you with water; but he will baptize you with the Holy Spirit." Mark 1:9-11: In those days Jesus came from Nazareth of Galilee and was baptized by John in the Jordan. And when he came up out of the water, immediately he saw the heavens opened and the Spirit descending upon him like a dove; and a voice came from heaven, "Thou art my beloved Son; with thee I am well pleased." Acts 19:2-6: And he said to them, "Did you receive the Holy Spirit when you believed?" And they said, "No, we have never even heard that there is a Holy Spirit." And he said, "Into what then were you baptized?" They said, "Into John's baptism." And Paul said, "John baptized with the baptism of repentance, telling the people to believe in the one who was to come after him, that is, Jesus." On hearing this, they were baptized in the name of the Lord Jesus. And when Paul had laid his hands upon them, the Holy Spirit came on them; and they spoke with tongues and prophesied. "Do you not know that all of us who have been baptized into Christ Jesus were baptized into his death? We were buried therefore with him by baptism into death, so that as Christ was raised from the dead by the glory of the Father, we too might walk in newness of life. For if we have been united with him in a death like his, we shall certainly be united with him in a resurrection like his. We know that our old self was crucified with him so that the sinful body might be destroyed, and we might no longer be enslaved to sin." (**NOTE - Here Jesus is talking about his crucifixion). Galatians 2:20: I have been crucified with Christ; it is no longer I who live, but Christ who lives in me; and the life I now live in the flesh I live by faith in the Son of God, who loved me and gave himself for me. (**NOTE - Paul was never physically crucified; as a Roman citizen, he was beheaded). Galatians 5:24: And those who belong to Christ Jesus have crucified the the flesh with its passions and desires. So, most people don't realize that when they are baptized they are also being crucified with Jesus, but the good news is that being crucified with Jesus means that we also get to rise from the dead into heaven with Him, to eternal life! This being crucified with Jesus through Baptism goes a long way in helping to explain why so many bad things happen to good Christians - It's part of the crucifixion process! So now that you know the necessity of Baptism, what are you waiting for? Get Baptized today and have the Holy Spirit come live in you, and make you a new creation!